From the millions of people who want to become professional musicians, only a handful ever do. One of the main reasons for this is that most musicians waste years pursuing the WRONG things that never bring them closer to becoming successful in this industry. Even though many honestly try and work hard to make it, they only grow more and more frustrated as their efforts don’t bring the results they are looking for. There are several key differences between how successful musicians build their careers, and how amateurs (try to) do it. Professional musicians succeed in the music industry because they expect greatness from themselves in everything they do and from everyone they associate with. Amateur musicians remain amateur because they accept mediocre results in their music careers. Amateur musicians spend most of their time playing in bands with musicians who aren’t serious about becoming successful at the highest level. Professional musicians only work with people who are 100% dedicated to making it in the music industry. Here is a quick test to tell you if your band is on (or close to) the pro level: Would everyone in your band drop what they’re doing to go on a big tour across the country (that would lose some money in the short term), to secure more profitable opportunities for the band’s future? If they wouldn’t (or couldn’t) do this, then your band has a long way to go to get to the pro level. To learn how to fix this situation for yourself and for everyone in your band, study this article about doing music as a full time career. Amateur musicians continually associate with band members, friends or peers who are pessimistic and criticize their dreams of becoming successful in music. Professional musicians fill their lives with people who empower and inspire them to achieve their musical dreams. They don’t waste time around negative people who bring down their ambitions of doing music as a career. I call this concept weeding your garden - something I described in more detail in this article on how to start a music career. Amateur musicians assume (wrongly) that they can navigate the music business on their own, without training or coaching. Instead, they are content with relying on trial and error or (even worse) simply copying what other musicians are doing. They assume that if they merely mimic what successful musicians do, they will get the same results. This approach is one of the primary reasons why most fail to break into the music industry. Professional musicians work with a music career mentor rather than mindlessly copying what others are doing, to make sure every action they take works as part of an effective strategy to bring them closer to THEIR musical goals. One of the most obvious signs of an amateur musician is the inability to perform well on stage. Being able to simply stand on stage and play your instrument is not enough if you want to put on a professional show that draws tons of people, sells out your music/merchandise and takes your band to the next level in the industry. Every time you perform on stage, it should inspire everyone in the audience to rave to all their friends about how awesome your band is (so they come see you next time you perform). 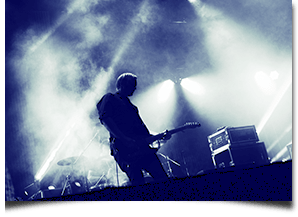 The more you do this, the faster you/your band will transition from playing small bars to larger music halls and eventually stadiums or major festivals! Musicians like to talk about how they lack of opportunities and how if only they were given a chance to grow their career, they would jump all over it. Fact is, most people PASS on most major opportunities that are put in front of them due to their own fears and insecurities. Case in point: from the thousands of people who apply for my Music Careers Mentoring Program every year, I screen and choose to accept only a fraction of that number (to ensure that I only work with those who are serious and have the best potential to become successful). Yet from the number of musicians who are accepted, there are always those who are AFRAID to join the program! Yes, you read correctly! Many begin to offer reasons (that I recognize immediately as nothing more than fear-based excuses) about not having the time, needing to think about it, not being ready, or a variety of other stories. at a high level in the music industry. This test will show if you are ready to become a professional in music. The point is that those same musicians who complained non-stop about not having the opportunities for growing their careers, now find themselves turning DOWN the big chance to finally get into the music industry on a big level. I hear from some of these musicians years later, and they invariably tell me the same sob story about how nobody ever gave them a chance to become successful and this is why they failed to become pros in this industry. Don’t be one of these musicians. Don’t let procrastination and inaction be the reason why you never become a professional musician. Don’t let your irrational fear of failure become the DEATH of your music career dreams... There will never be a better time than NOW to begin recording your first album, start a new band, work on your songwriting skills or get the music career training you really need to make it in the music industry. Any rationalization to the contrary is nothing more than an excuse. To take big steps to advance your music career, first determine your greatest musical goals, then work together with a mentor who will guide you every step of the way until you have achieved them. It’s simply not possible to build a successful music career if you spend every moment of your free time exhausted because you work all day (at a non-musical job). One way to break free of your day job and start working full time on your music career is to develop a strategy for smoothly transitioning from one to the other. For example, you could reduce the hours you spend at your day job from 40 per week to 35 and spend the extra 5 hours working on your music career. Once you begin making music related income, you can continue to reduce the amount of time you spend at your day job and phase in your music career even more. Learn more about how to do this in this article on how to transition from a day job to a career in music. Truth is, the music business is an extremely secure industry to work in (for those who follow the right steps for making a living in music). Most of the true professionals in the music industry are NOT starving artists... they earn a comfortable living doing what they love and are simply not famous enough to be well-known. In fact, it is much easier to make a lot of money in the music industry than most people think and have that income be very secure. Despite this, countless musicians listen to the pessimistic advice of others who haven’t even worked in the music industry. As a result, they start believing that their musical dreams are too unrealistic or even impossible. To become a successful professional musician, you must ONLY listen to those people who have achieved the success you want to achieve. It makes no sense to listen to well-meaning (but misguided) advice of friends and family members who only parrot back myths and conventional wisdom about the music business without any first-hand experience in this industry. Remember, your favorite musicians all began at or below where you are now in your music career before going on to achieve great success. The only thing that prevents you from accomplishing these things is your own mindset! Amateur musicians spend a lot of time recording their own music and practicing their instruments, but have no idea how to make a living from these things. It’s very common for musicians to spend months writing and recording their first album, then finally release it online where no one ever hears it (much less actually buys it). As a result, they become frustrated, their music careers completely stall and they never attempt to do anything significant ever again. You will not make a good living as a professional musician by taking isolated actions like the above. Pro musicians earn good money by thinking (and acting) as entrepreneurs, building strategically connected multiple streams of income and by studying with a proven mentor to learn how to create their own opportunities in the music business. Now that you understand the reasons why you aren’t yet making a full-time living as a professional musician, learn the strategies you need to break into the music industry by reading this page about music career training. Build a highly successful music career by working together with a music career success mentor.